Let me start with love. I enjoyed reading the first 80 pages. The pictures are great, and some explanations are very well thought out. 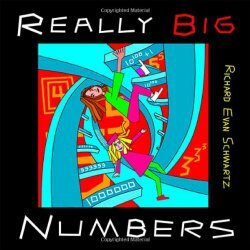 Plus, I haven’t thought much about really big numbers, so the book helped me understand them. I was impressed with how this book treats very difficult ideas with simple explanations and illuminating images. I was captivated by it. Now to hate. I had two problems with this book: one pedagogical and the other mathematical. The pedagogical issue. The beginning of the book is suitable for small children. Most of the book is suitable for advanced middle-schoolers who like mathematics. The last part is very advanced. Is it a good idea to show children a book that looks like a children’s book, but which soon becomes totally out of their reach? Richard Schwartz understands it and says many times that pieces of this book might be read several years apart. Several years? What child is ready to wait several years to finish a book? How would children feel about the book and about numbers when no matter how hard they try, they cannot understand the end of the book? As a reviewer, I can’t recommend the full book for kids who are not ready to grasp the notion of the Ackermann function or arrow notation. Even if the child is capable of understanding these ideas, there are mathematical issues that would prevent me from recommending it. The mathematical issue. Let me start by explaining the notion of plex. We call an n-plex a number that is equal to 10n. For example, 2-plex means 102 which is 100, and 10-plex means 1010. The fun part starts when we plex plexes. The number n-plexplex means 10 to the power n-plex which is 10(1010). We can continue plexing: n-plexplexplex means 10 to the power n-plexplex. When you are hunting for really big numbers, it is easier to write the number of plexes rather than writing plexes after plexes. Richard Schwartz introduces the following notation to help visualize the whole thing. He puts numbers in a square. Number n in a square means 1-plexed n times. For example, 2 inside a square means 1010. Ten inside a square is 1-plexplexplexplexplexplexplexplexplexplex. We can start nesting squares. For example, 2 inside a square means 1-plex-plex or 1010. Let’s add a square around it: 2 inside two squares means 1010 inside a square, which equals 1 plexed 1010 times. To denote 10 nested in n squares Richard Schwartz uses the next symbol: n inside a pentagon. For example, 1 inside a pentagon is 10 inside a square. I wrote this number in the previous paragraph: it is 1-plexplexplexplexplexplexplexplexplexplex. Similarly, n inside a hexagon means 10 inside n nested pentagons. We can continue this forever: n inside a k-gon is 10 inside k nested (k-1)-gons. What bothers me is why a square? Why not a triangle? If we adopt this scheme, what is the meaning of a number in a triangle? Let’s try to unravel this. Following Richard Schwartz’s notation we get that n inside a square is the same as 10 inside n nested triangles. What do we do n times with 10 to get to 1 plexed n times? 1-plexed n times is 10 plexed n-1 times. There is a disconnect in notation here. For example, 10 in two nested triangles should mean 2 inside a square that is 1010. 10 inside one triangle should mean 1 inside a square which is 10. This doesn’t make any sense. I started googling around and discovered the Steinhaus–Moser notation. In this notation a number n in a triangle means nn. A number n in a square means the number n inside n nested triangles. A number n in a pentagon means the number n inside n nested squares. And so on. This makes total sense to me. If we move down the number of sides, we can say that the number n inside a 2-gon means n times n and the number n inside a 1-gon means n. This is perfect. Schwartz changed the existing notation in two places. First he made everything about 10. This might not be such a bad idea except his 10 inside a square doesn’t equal 10 inside a square in Steinhaus–Moser notation. In Steinhaus–Moser notation 10 inside a square means 10 plexed 10 times. The author removed one of the plexes. He made 10 inside the square to mean 1 plexed 10 times, and as a result it stopped working. Even though the first 83 pages are delightful and the pictures are terrific, the notation doesn’t work. What a pity.